Mental Health and More...: "Richard...Is There A Mark On My Face? It Hurts." "Richard...Is There A Mark On My Face? It Hurts." The title of this article may or may not have anything to do with the article, but I liked it. 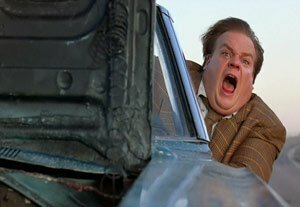 It comes from a scene in the movie "Tommy Boy" after David Spade hits Chris Farley in the face with a 2X4. The clincher is that they are friends, or at least trying to be friends and they get in a fight. How often do we do similar things? I am not saying that we get hit in the face by others, at least I hope that does not happen. Rather, we invest our time, energy, and emotions into a relationship and get the proverbial slap in the face...or we get burned. These very situations came to mind recently when a friend approached me and asked for my thoughts on professional burnout. Burnout is a mental state of exhaustion and can be observed by "emotional depletion and a loss of motivation and commitment" and are usually associated with job factors rather than biological reasons" (Schaufeli, DATE, p. 7). It leads to physical symptoms (fatigue, muscle tension, G.I. distress, etc. ), absenteeism, and job turnover. It can also be affected by a lack of social support in the work place. It happens due to job stress that exceeds an individual's resources. It results ultimately in the professional demonstrating behaviors of cynicism, apathy, and rigidity in the workplace. Overall, it affects the professional's capacity to function, especially in the helping profession. It is a tiring place to be. My friend described his situation and it sounded similar to the definitions above. I can relate as I have experienced "burnout" or "compassion fatigue" as they now call it. Trust in human beings is depleted, you question your own self-worth, etc. But, rather than go into a slow spiral into the abyss of burnout, I'd rather talk about how to work through it. By definition, it relates to stress and one's own personal resources. Therefore, it stands to say that if the resources were not sufficient or failed, then they need to be looked at. It may require a break from the career field, if possible, the professional will need to seek their own help (i.e. counseling). One has to make self-care the priority, rather than work. Activities, recreation, reading a good book, exercise, setting goals and completing them, and many more are just some examples. I know with myself, I have had to rely on others for a time to pull out of the burnout. I have had to take a good look at my own belief system regarding my role as a professional, a father, a husband, a friend, etc. and see what beliefs were adding to the burnout. The results can be liberating, but the climb out is uncomfortable, yet possible. It is easy to get stuck in it and become a victim of it, but relying on a Higher Power (to use the AA verbage) or God can result in fostering a sense of hope. Most importantly, relying on close family and friends as a resource can be the difference between success and continued burnout.